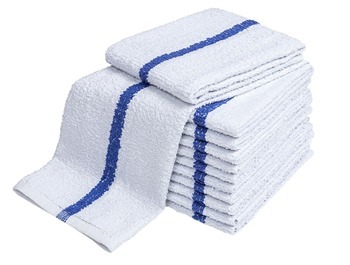 Our most popular terry bar towels are the 28oz with blue stripe. 100% cotton and available in 28, 30 and 32oz. All Wholesale Restaurant Towels are sold in bulk. 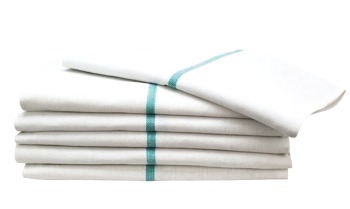 Our most popular herringbone kitchen towels are the 24oz. Practically a Lint Free Glass Towel. Blue, Green or Red Stripe. Easily identifiable Stripe (stripe patterns may very) Ideal dish towel for low lint needs. Great for glassware and silverware. Wash and dry prior to first use. These wholesale restaurant towels are also available in 21oz. Great for glass, windows and stainless steel.